Welcome to the Planet of the Apes Multimedia Site. This POTA Multimedia site was created by Alexander Ruiz in 2000. It was removed from the 'net in 2001. It has been restored here with Alex's permission. 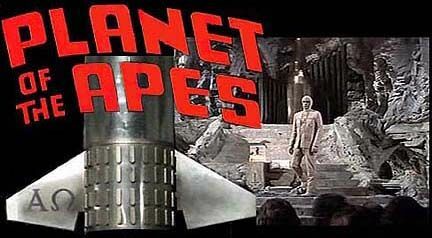 All Planet of the Ape materials on this site are simply for entertainment purposes only. For all materials on Planet of the Apes are strictly owned and copyrighted by 20th Century Fox. This POTA Fan site features entertainment sections on all five films, fan art, t.v. spots, interviews, links and much more. The Planet of the Apes saga began with La Planete des Singes (Monkey Planet), a 1963 novel by French author Pierre Boulle that combined speculative fiction adventure with Swiftian social satire. 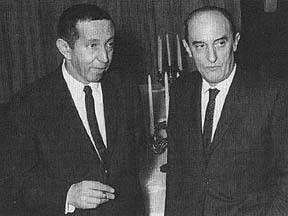 In 1964, publicist-turned-producer Arthur P. Jacobs read the book and with the help of associate producer Mort Abrahams began working to bring it to the big screen. The process was long and difficult. After Jacobs joined with Blake Edwards, who was to direct the film for Warner Brothers, the studio estimated the budget would surpass $10 million. No one in Hollywood or in Europe was willing to risk that much money on a concept as unbelievable as a planet of talking apes. In time, Edwards departed for other projects and the on-again, off again Ape film was shopped around and rejected by the studios for years. Eventually the tenacious Jacobs secured the involvement of writer Rod Serling, actor Charlton Heston, and, on Heston's recommendation, director Franklin J. Schaffner (Director of later Oscar winning Patton). Jacob's APJAC productions brought the budget estimate down to $5.8 million and produced a screen test starring Heston as Astronaut Thomas and Edward G. Robinson as the orangutan Doctor Zaius. The test utilized paintings to depict major scenes witch led up to the filmed conferontation between Heston and Robinson, which was written by Serling and directed by Schaffner. The minifilm proved to the head of 20th Century Fox Richard Zanuch as well as too it's executives that talking apes would not evoke unwanted laughs and Zanuck gave Arthur P. Jacobs the green light! E-mail Address: Alexander Ruiz The POTA Webmaster of this site.